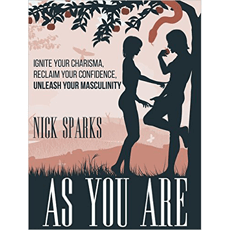 This book is designed to show men how to become naturally attractive. It is intended to help develop charisma and attract women, while highlighting what men do that sabotage them from being there most charismatic self in interactions. "The best program I ever purchased"
I managed to get this item on sale for 99 cents, and it is proof that the best materials are not the most expensive ones. I have purchased countless dating programs over the last three years, and a lot of them are either complicated or just are not good. I will not say any names of certain coaches, but some of those programs tend to just get you pumped and even feeling a bit arrogant. Some of those programs simply work once, maybe twice, on the same woman, and then they grow stale because you are actually doing some kind of scheme or "technique" that can woo a woman for once. Nick says it like it is, and he doesn't try to sell you something mid book. No, this book is something that I read like a bible whenever I feel like I "screwed up" with my woman, and then she comes up to me and lets me know how she feels. Other programs are nice, but purchasing this one makes me want to not purchase anymore regarding how to talk to a woman because it explains it in simple terms. If you are struggling just a bit, buy it. It's cheap, and you have nothing to lose.